Patient Care America, the nation’s premier provider of NutriRite IDPN and IPN renal nutrition therapies, has been named as one of the top mid-sized companies in South Florida for 2018 by the Sun Sentinel Media Group. 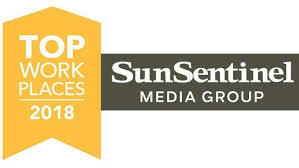 Each year, the Sun Sentinel Media Group puts together a list of the best places to work in South Florida. Nominated workplaces are judged based on feedback from a survey, which allows for employees to anonymously give their feedback about their overall workplace experiences. There were 20 workplaces who stood out as Top South Florida Workplaces this year in the mid-sized category (125-399 employees). “We’re very proud to learn that Patient Care America was nominated for this award by one of our employees, and we were thrilled to be chosen as one of the top mid-sized companies in Broward, Miami-Dade, and Palm Beach counties,” said Patrick S. Smith, President and CEO of Patient Care America. The Sun Sentinel surveyed more than 18,000 employees in South Florida as part of their Top Workplaces initiative, and more than 11,000 employees responded to the survey. The survey gathered responses from employees on items such as organizational health, alignment, effectiveness, connection, leadership, engagement, pay, and benefits. Patient Care America’s core values are reflected in the workplace by offering employees recognition, bonuses, and other fun events to help celebrate and reward the company’s success. The organization also strives to help its employees grow by promoting from within and providing professional development where needed. Patient Care America was founded as a specialty pharmacy focused on renal nutrition therapy for malnourished dialysis patients. Headquartered in Pompano Beach, FL, Patient Care America is committed to the highest quality patient care to achieve optimal therapeutic outcomes. The company’s dedicated team of pharmacists, dietitians, nurses, account managers, and patient care coordinators deliver exceptional quality service in every single detail for healthcare professionals and their patients. Patient Care America is proud to offer our NutriRite IDPN and IPN renal nutritional therapies, along with a suite of patient and clinician services to support and educate those we serve.